Joseph Simon Gallieni (24 April 1849 - 27 May 1916) was a French soldier, most active as a military commander and administrator in the French colonies and finished his career during the First World War. He was made Marshal of France posthumously in 1921. Historians such as Georges Blond, Basil Liddell Hart, and Henri Isselin credit Gallieni with being the guiding intelligence behind the French victory in the First Battle of the Marne in 1914. Gallieni was born in Saint-Beat, in the department of Haute-Garonne. He was educated at the Prytan�e Militaire in La Flx�che, and then the x�cole Sp�ciale Militaire de Saint-Cyr, becoming a Second Lieutenant in the 3rd Marine Infantry Regiment before serving in the Franco-Prussian War. He was promoted to Lieutenant in 1873 and Captain in 1878. He was later posted to Africa in the mid-1870s, taking part in explorations and various military expeditions. After serving in Martinique, Gallieni was made governor of French Sudan, during which time he successfully quelled a rebellion by Sudanese insurgents under Mahmadu Lamine. From 1892-96 he served in French Indochina commanding the second military division of the territory, before being dispatched to Madagascar, where he served as governor until 1905. There he again suppressed a revolt, this time by monarchist forces. In Madagascar, Gallieni implemented the "oil spot" method, which continues to influence counterinsurgency theory to this day..
A favored choice for supreme commander of the French Army in 1911, Gallieni declined the position in favour of Joseph Joffre, pleading advancing age and ill-health. 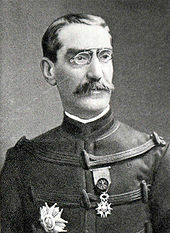 Retiring from the army in April 1914, Gallieni was recalled in August to assist in the defence of Paris prior to the First Battle of the Marne. Joffre, wary of Gallieni's influence and reputation, marginalised Gallieni's role to an extent. Joffre kept him at arm's length from headquarters, although it is widely believed that Gallieni's energy and foresight was what saved Paris from the Germans. While credit for the successful defense of Paris was largely assigned to Joffre, the fact that some believed Gallieni had actually won the battle once prompted Joffre to remark famously, "Je ne sais pas qui l'a gagn�e, mais je sais bien qui l'aurait perdue." (I do not know who won it [the battle], but I know well who would have lost it."). Gallieni saw an opportunity to attack when the German First Army turned east in early September, sending the Sixth Army to strike its flank, and subsequently rushing reserves to the front by commandeered taxis in response to German counter-attacks. Upon seeing the "taxicab army" ferrying troops to the front, Gallieni made one of the most oft-quoted remarks of the First World War: "Eh bien, voilx� au moins qui n'est pas banal!" ("Well, here at least is something out of the ordinary!"). The actual effects of the "taxicab army" on the French victory at the Marne may have been more modest than the myth.